Francesco Bianchi Ferrari's Arion riding on a Dolphin is inspired by poet Publius Ovidius Naso (43 BCE-17/18 CE) more commonly known as Ovid. Ovid was a Roman poet who lived during the reign of Augustus and is famed for his long narrative verse Metamorphoses which re-tells some of the most well known greek and roman legends (The Myth of Narcissus, The Fall of Troy, Death of Hercules). Ovid has inspired generations of artists from Botticelli and Velazquez to Anish Kapoor and Chris Ofili. The familiarity and popularity of the stories he told made them ideal subject matters for makers of art in silver, bronze, ivory and ceramics as well as for painters. Arion riding on a Dolphin is inspired by Ovid's the Fasti, a poem about the roman calendar. It's a creative celebration of the customs, festivals and myths that filled the Roman year. For 3rd February when the Dolphin (Delphinus) constellation disappears, Ovid tells the tale of singer Arion, who after winning silver from a music competition in Sicilly, is thrown into the sea by Corinthian sailors who are after his money. Arion is saved by a dolphin sent by Jupiter who was charmed by his music and is safely returned to Corinth. Unusually, Arion appears as a young boy in Ferrari's interpretation. 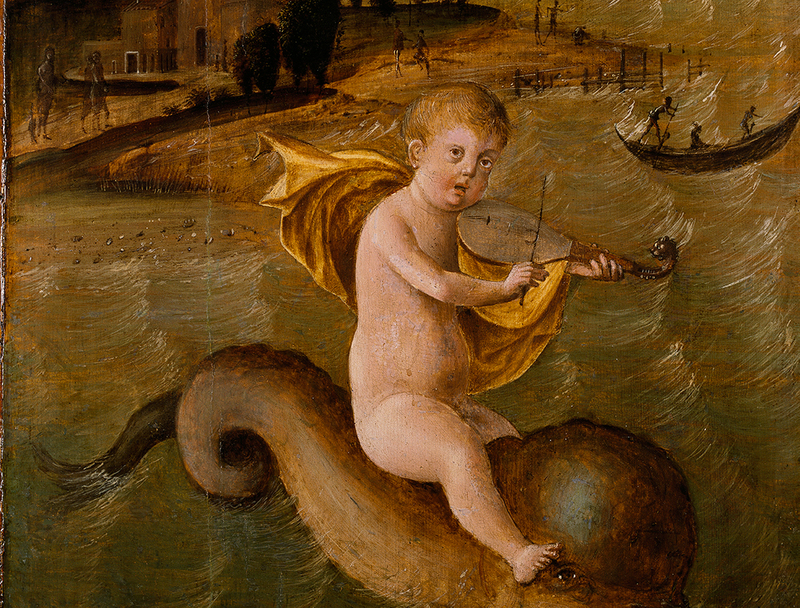 In ancient sculpture Love or Cupid is often shown as a boy riding a dolphin. 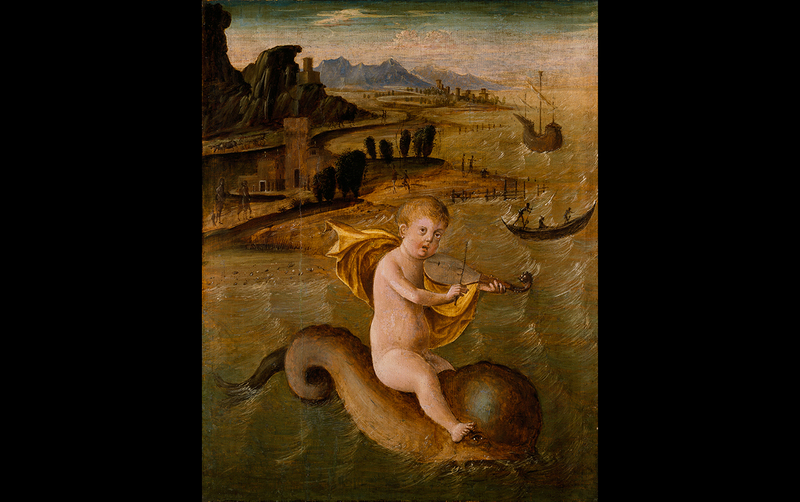 Painted in 1509-1510, this playful image may have had some private meaning for its owner. Presented by the daughters of James Reddie Anderson, 1947. Want to view our our selection of treasures?